Hi Stampers, Lesley here! I can't believe we are on Challenge #20 already!!! Whew! What a great lot of fun this challenge blog has been and I am enthralled with all the participants who play along each week!!! Thank you for joining us last week with Jaydee's fabulous colour challenge! The winners for that challenge can be found HERE. 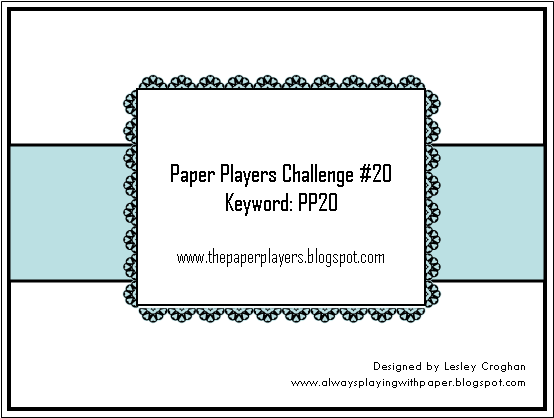 It is my turn this week to host our challenge and I have a simple sketch for you to try! 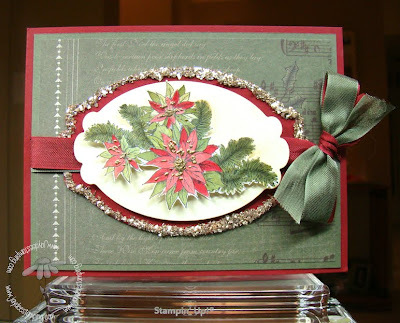 At the Paper Players we encourage everyone to play and so please use any stamping products you may have on hand! We all use Stampin' Up Products. For my card, I used the adorable Stampin' Up set called "Holiday Line-Up". I also used the technique called Spotlighting which is perfect for stampers who love cute images but may not always have the time to colour. 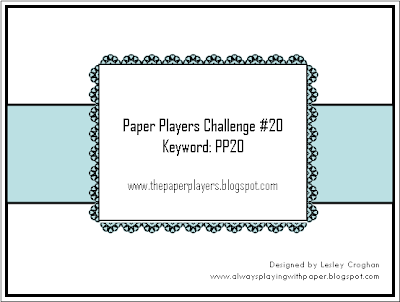 Please visit my blog http://www.alwaysplayingwithpaper.blogspot.com/ for more information. First Layer: 3.75" x 5"
Centre Strip: 2" x 5.25"
The fabulous Paper Players have come up with some real beauties this week! Love this sketch Lesley. So simple and easy to add to. Great idea. Thanks for a fun sketch challenge! Beautiful cards from the design team, lots of inspiration! Thanks for the sketch this week. It's always fun to participate, but I Just squeaked this challenge in.